For me, the collecting season always ends with The Cup and begins anew with Artifacts. Technically, Artifacts is the third product to come out after MVP and OPC, but it's the first product that veteran hobby collectors really look forward to with high interest. Artifacts gives collectors a solid number of hits for a reasonable price. The rookie redemption program in Artifacts sort of future-proofs the product because it allows collectors to find awesome cards of potentially very hot rookies even before the season starts. This year's Artifacts base card is a winner. The card has a very premium, glossy feel, and a healthy amount of foil to it. Artifact base cards have always been very nice, but I think this year's is one of the top designs yet. Upper Deck has somehow managed to cram a whole lot of elements into a cohesive looking card. 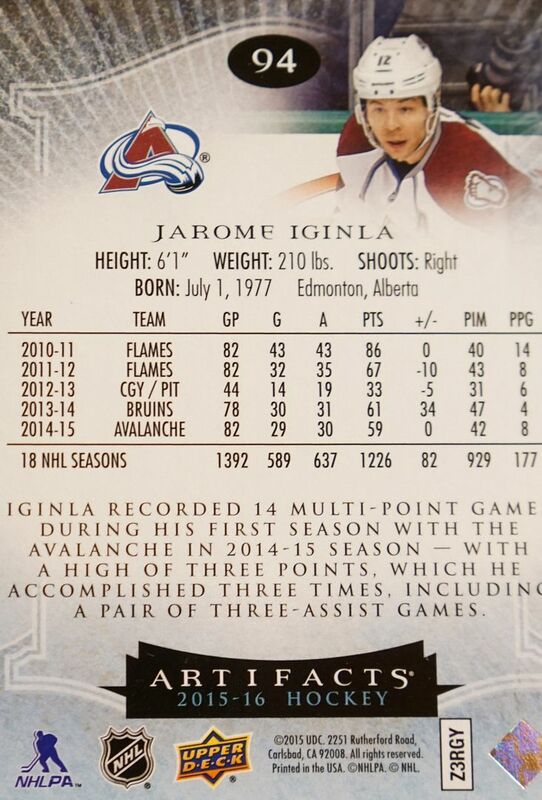 My favorite part of the card has to be the team logo that is placed right below the player image. It's imprinted in gold foil beautifully. Kudos to Upper Deck for this base design - it's excellent! The back of the Artifacts base card is also very strong. It is much less ornate than the front, but it serves its purpose well and still with a flair. I am a fan of how the front elements are subtly seen the the background of the card. It's there, but not a distraction. The stats of the player can be read easily and the card includes a nice write-up. The main set of Artifacts has three categories of serial numbered cards included within it - Stars, Legends, and Rookies. The Stars cards are serial numbered to 999, the Rookies to 999, and the Legends to 499. The Stars and Legends share a very similar design to the standard base card, where as the rookies have a look all their own. Artifacts new configuration has collectors receiving less packs per box this year. In the past, a box of Artifacts pretty much guaranteed an autograph... but not this year. After closely reading the box, each box just guarantees 3 hits. In theory all three hits could be plain jersey cards. Hmm... that's a puzzling step backwards in my opinion for this product. Speaking of plain jersey cards, these dual relics are the staple of the Artifacts set. The most basic is this version with two jersey swatches. These cards can be considered a parallel to the basic set as Upper Deck simply takes the standard base card and inserts a couple of jersey pieces in. These are numbered to 125. As the numbering gets lower, the pieces filling the swatch holes get better. This version of the card contains both a jersey and a patch pieces rather than just two jersey pieces. Unfortunately for myself, the patch is a plain white one. To mix is up a bit, Upper Deck has some insert themed relic sets such as these Frozen Artifacts cards. It's great to have more card designs, but the jersey piece seems to be smaller than the norm. And yes... I did get three Phil Kessel hits in this box. Wow Upper Deck. Wow. Besides relics, Artifacts is known for its vast array of parallel cards. 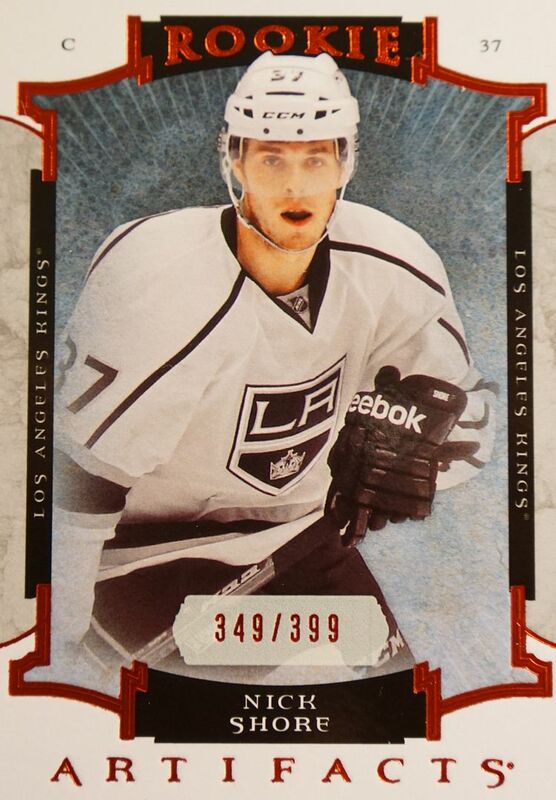 I've taken on the challenge of putting together a full set of Logan Couture Artifact cards from a couple of different years... and it was difficult! Artifacts print runs that go down to /5, /3/, /2, and /1. It's really nuts! I challenge anyone to try and put a complete rainbow together. Once all the cards are together though it looks great! My box contained a standard rookie redemption card that has been typical of Artifacts in years past. I'm usually completely fine with it, except that this year there are quite a few relic and autographed versions that have been packed in. Those versions have a roman numeral on them and tell you exactly what your redeemed card will come with... be it an autograph, jersey, or patch. So overall Artifacts is the product we've really known and come to love... but at the box buying level, it has fallen short a bit. No longer are autographs pretty much a given. You could be like me and get just three relic cards. If you're luckier than me, you could possibly find autos, sticks, and all sorts of amazing combinations of relics. I have very mixed feelings about this year's Artifacts set. The cards look great, and I think it still offers collectors some great relics to search for... but the fact that there is not a guaranteed autograph per box really gets to me. Sure, often times the autograph would turn out to be some Autofacts card that wasn't really that great, but I think I still appreciated the fact that there would be an autograph in the box. I was really shocked and miffed not to get any ink in my box of Artifacts this year. That plus all my hits were of Phil Kessel... sheeesh! I'm sad to say that I think Artifacts this year has taken a step back. I want to say nice hits, but having three from the same player, 4 jersey pieces being the same colour (albeit different jersey material - back/sleeve/front if I'm not mistaken), and a single colour patch swatch is a bit of a disappointment. I certainly agree that Artifacts has taken a step back, which is unfortunate since this marks another 'season' of a less-than-stellar release. Still feel that the 2012-13 and/or 2013-14 releases were the best in the last few years. Nice pull too bad you got so many kessels, in leafs. 3 Kessel hits! lol! 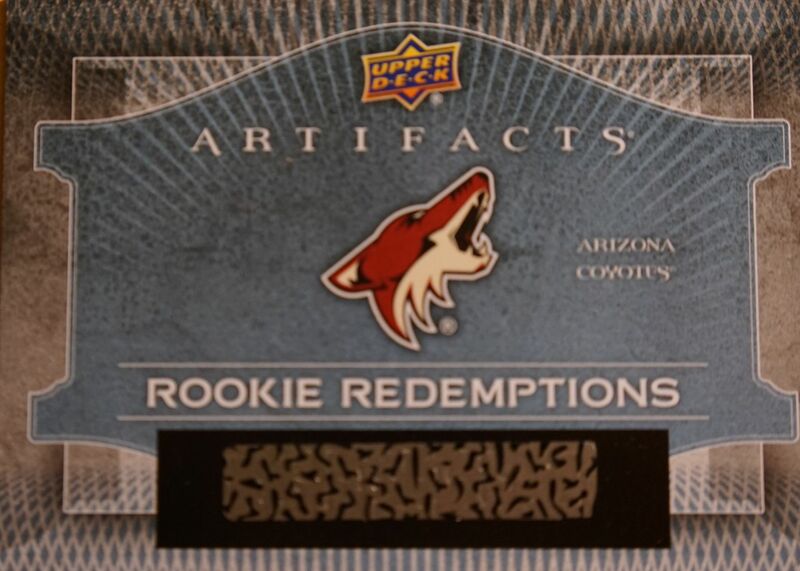 And also that Coyotes rookie redemption might be worth something because of there 3rd overall draft pick Dylan Strome. 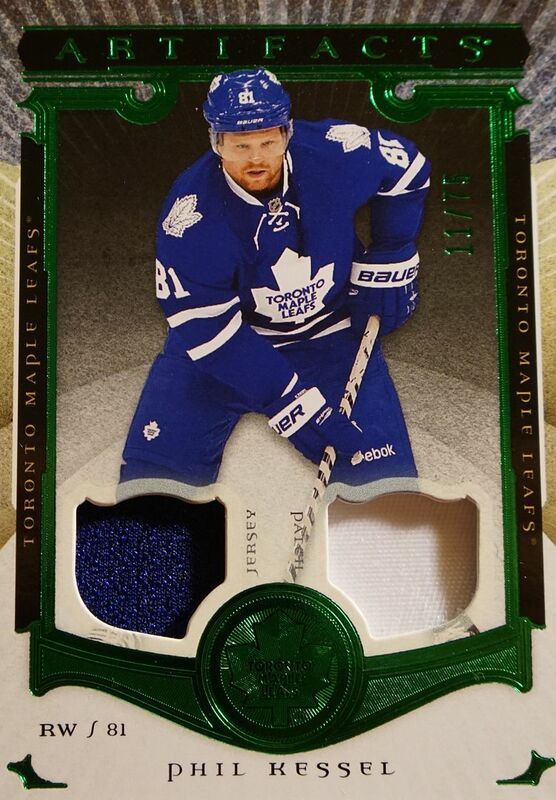 Very wierd for upper deck to put in three Kessel cards. Otherwise it's an alright product. 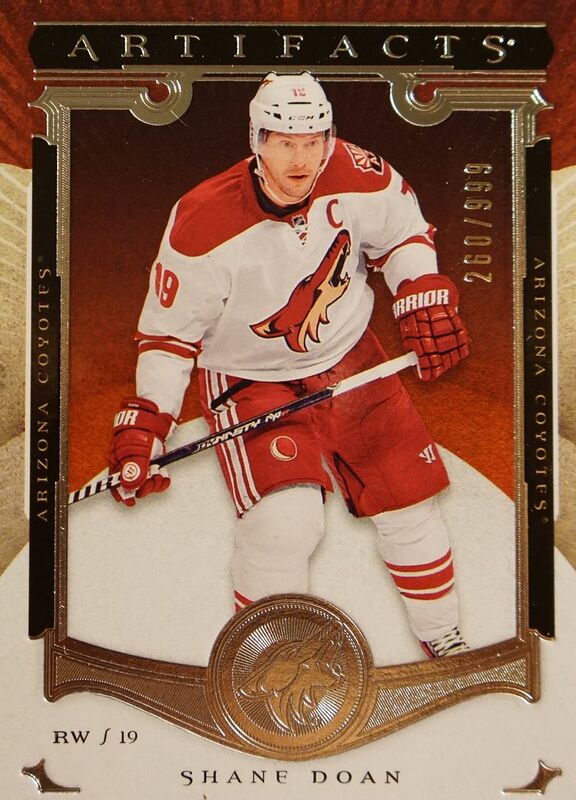 Would love to get my hands on that coyotes are redemption! As it is Max Domi! Artifacts is one of my favorite hockey card products. Also some nice Phil Kessel cards. 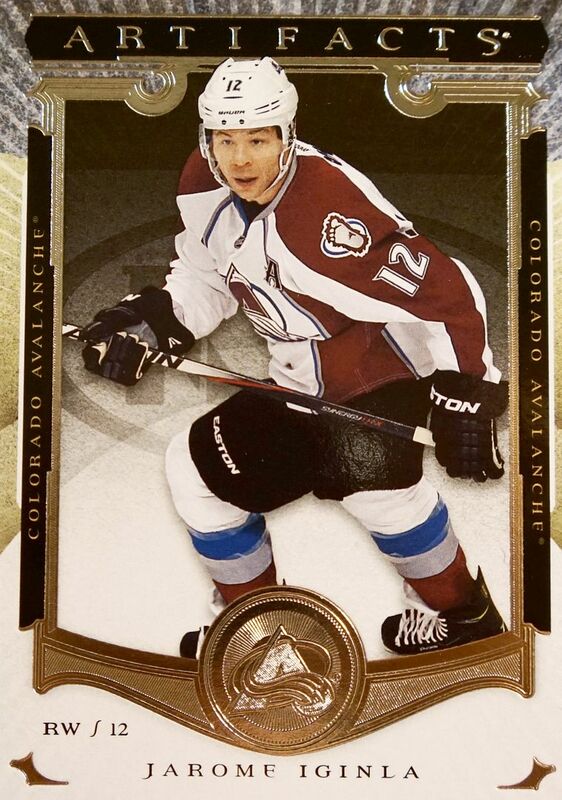 Sorry Upperdeck, but I'm not a big fan of Artifacts this year. The base cards have a little bit too much foil for my liking. The hits that you get in an average box aren't very exciting to look at, and only having 8 packs is a little underwhelming to me. Overall, I'd give Artifacts a 6/10 this year. Artifacts has turned into a hit or miss now. Good review though. I am a big fan of the rookie redemption but artifact disappointed me this year, I hope you have a good redemption! Weird how you didn't get an autograph and 3 Kessel hits. But overall, a nice product for upper deck. 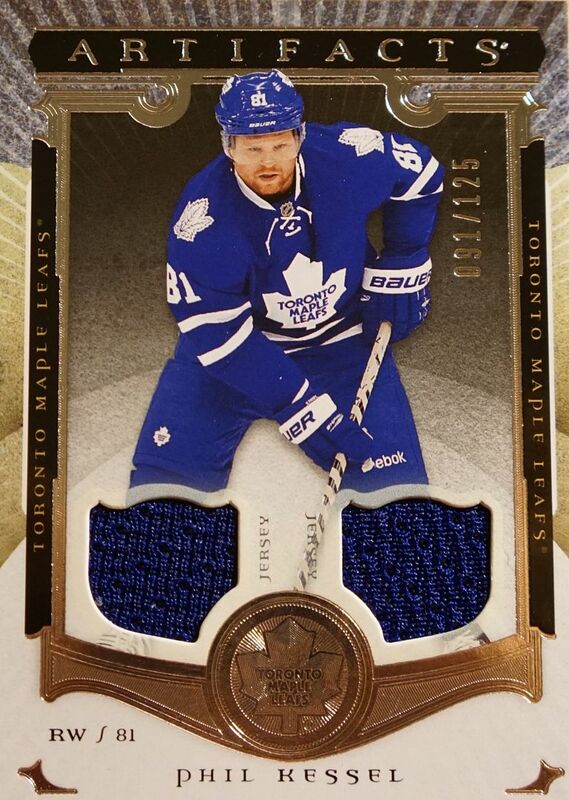 Clearance on Kessel's leaf jersey swatches! I can't beleive you got all Kessel hits man that blows my mind! haha I love the look of the base cards and the serial numbered cards look great too! By the way you didn't get an autographed card because you got 3 memorabilia cards instead like the box states. Love all the Kessel cards! Holy Kessel Batman!!! Well at least the rookie redemption should be Max Domi. Thanks for the video and review. I think last year's Artifacts was better. I think it's too much money for half the inserts-hits being numbered cards... and if your hits are all of the same player... well not that good eh? Nice base design this year. Parallels are great. + Good base card design, with nice foil details. + You can pull great cards, like the acetate stick cards which I forgotten the name of. - It's a shame that UD have discreased the amount of hits, so that you now not are guaranteed an autograph. - High-numbered parallells and mass-produced jersey cards isn't that exciting. Does anyone know the production number of max domi auto patch rookie relic cards?